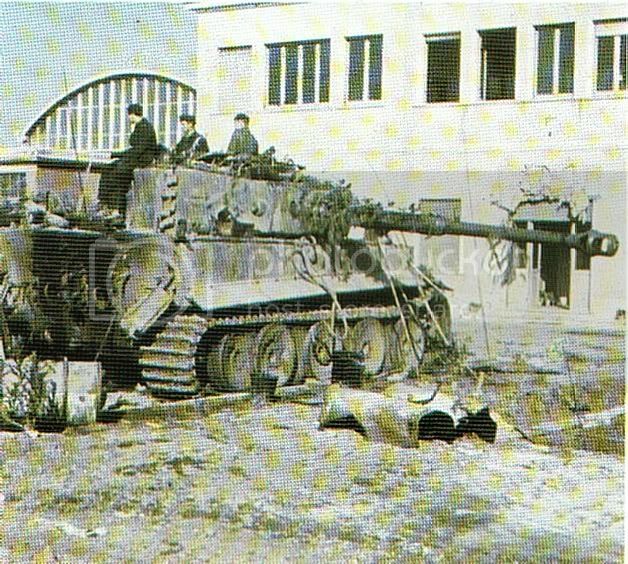 Nice one that was captioned as a Tiger in Italy 1944. Other photos [that won't scan properly] in the bunch show a Large 1[RED/ White outline] followed by a small 22 [White] on the forward front side of the turret. First photo from war album n01. Others from the net. 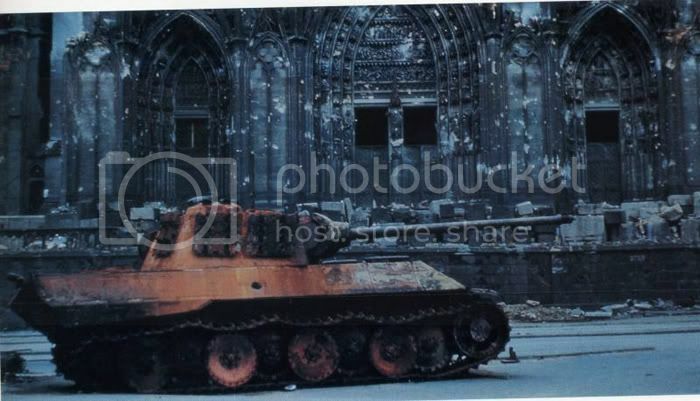 A great color image of that b+w from the back of the Squardon Signals book on Panthers. Cologne Cathedral. More colour pics, kulled from the net..
Just look at all the vehicles, all display a differing camo scheme, all display a differing camo colour, all the tones and shades are different. This for me really negates the argument of 'correct colour'.. all the damn colours are different, some are covered in a layer or dust, others, like the trailer with 'Koln' (Cologne) on the side look relatively freshly painted..
And the thing that really kicks you in the balls, is that if you convert the image to B&W, all the vehicles become virtually the same colour..not so much the car in the foreground, as it looks to be covered in a layer of dust and road grime, but the cars directly behind the trailer... what hope do we have? Thanks for starting this thread Hilly! The day this is work, the love of it dies. I have never seen the 1st 2 you posted. Your last one along with your statements - I whole heartedly agree with. I am always wondering how someone can discern colors from a b&w photo as in which dark gray swath is the green and which dark gray squiggly line is the brown? How does one know the difference? Good Thread. I can think of a couple of people that should look at Sam's last two pics! Location: I know a guy who sells t-shirts at a nearby location to Willy's grave. Opening Laz's World on Ice next summer, no franchises. Just cold ice, and figure skaters, ring side bar service. Nice pics guys! Sam, excellent demonstration of how hard it is to determine colors from BW pics. Here' s a few more color pics that I grabbed off ML. In this last pic, note the color of the barrel. ...I'm a KA by God!